My children have taught me that it is more fun to graze a garden than to harvest its produce, bring it into the house, wash it, prepare it, or cook it, or refrigerate it for later. Apologies to my wife. 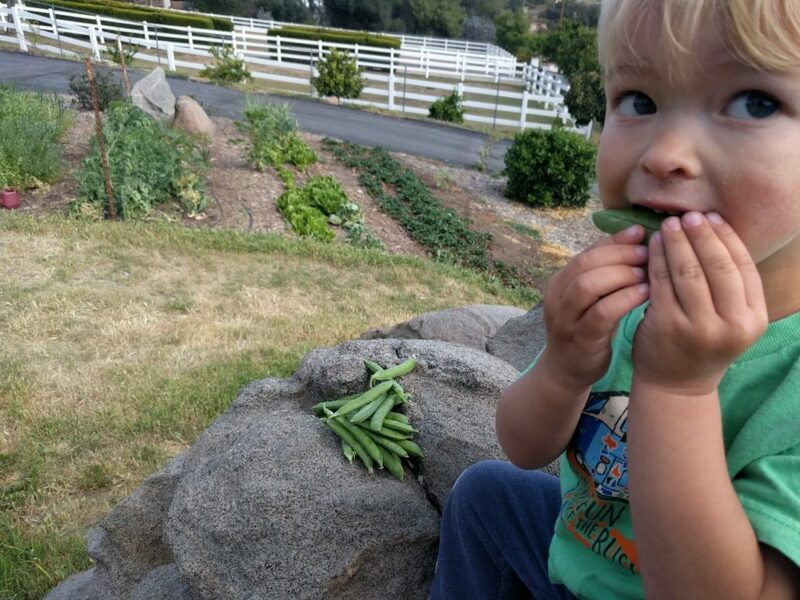 I used to grow snap peas for her because she likes to make stir fries, but these days all of our garden peas are the shelling types because that’s what the kids like to graze on. It’s here in late January or early February that the plants start to have enough plump pods to draw the kids. They park next to the plants and pick away. The pea plants that we are grazing on now were sown back in October. That’s one of the two best times to sow peas in Southern California. Peas like it cool. So they get up and growing through the fall as it cools down from summer, then the plants slow down a bit in December when the days are short, but speed up again when days lengthen in January. Peas sown October 14, 2016. Photo taken on February 9, 2017. The other best time to sow peas is now, late January or early February. Sow them now and they grow fast and taste great all the way through spring. It is also fine to sow or plant peas anytime between October and February. Earlier than October has never worked so well for me, however. Perhaps it’s because it’s still too warm. Between 55 and 65 is said to be ideal. Later than February reduces your harvest since temperatures get uncomfortably warm for peas by summer. Even though peas like cool temperatures, they also like lots of sun. My best pea crops have grown through the winter in locations that get sun all day long. Yet! I made a mistake with one row of peas this last October and sowed them where they are in the shade of our house starting at lunch time. Here on February 1 they are barely starting to produce. Compare these to the peas in the photo above taken in early February a couple years ago. Those plants were also sown in October, but in full sun, and they were much bigger and productive. What a difference sunshine can make. My tried and true method for sowing peas is to first make sure the garden soil is thoroughly wet. In October, that might mean watering. In February, it’s likely that the rain has already done that for you. Second, I use a stick to poke holes a knuckle or two deep and a couple inches apart. 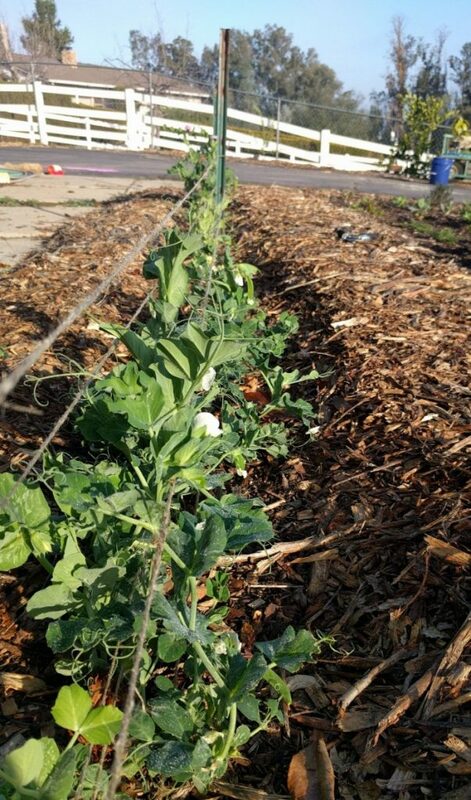 The peas can be dropped right in the holes, covered up, watered lightly to settle the soil, and then left on their own. No more watering until the pea plants are up and growing with a few leaves. In fact, if you insist on watering before the plants are up and growing, there’s a chance you’ll rot the seeds. Resist that urge. That’s the way I usually do it. However, sometimes I pre-soak the seeds. Just drop them in a cup of water for a day or two before sowing. 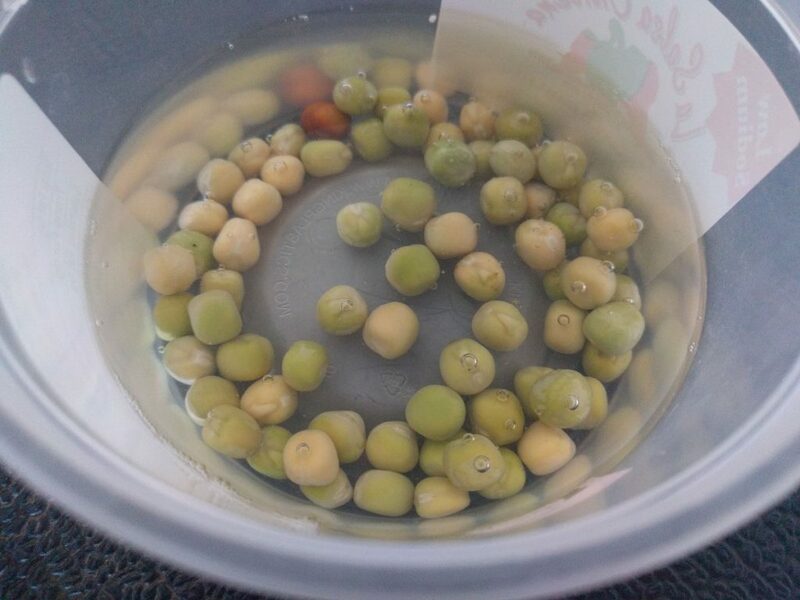 Pea seeds soaking in cup of water. It’s unnecessary, but sometimes I do it for the October sowing because October can still be very warm and the soil hasn’t been rained on for months and I just like knowing the seeds are fully imbibed before being sown. Also, I sometimes sow my seeds in trays instead of directly in the garden. The advantage of this is in saving time and garden space. Sowed these peas on January 13, 2019 to be planted early February. It’s the same as buying pea seedlings at a nursery. You don’t take up weeks of garden space while seeds are germinating and getting up to size there. 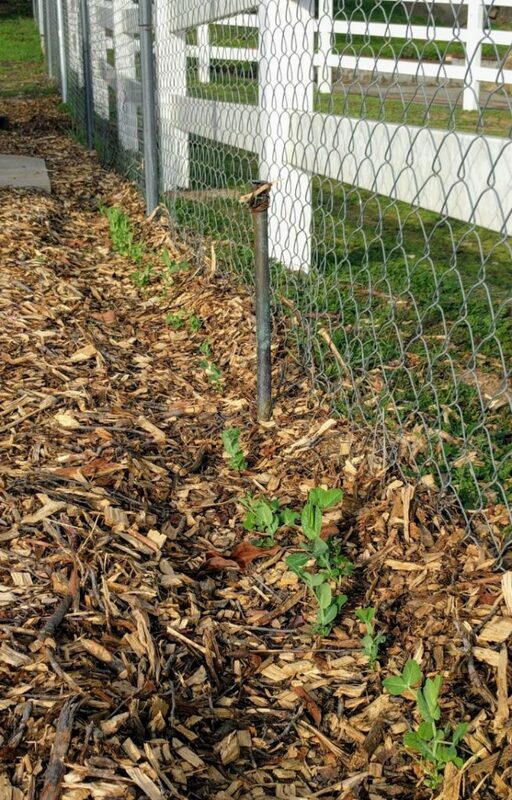 Pea plants transplant just fine. But you do have to be aware that they grow fast and their roots get big and bound in the modules before the tops (leaves) of the plants look big. They have extremely vigorous roots. Because of this, if buying seedlings at a nursery, I’d choose small plants rather than large rootbound ones. 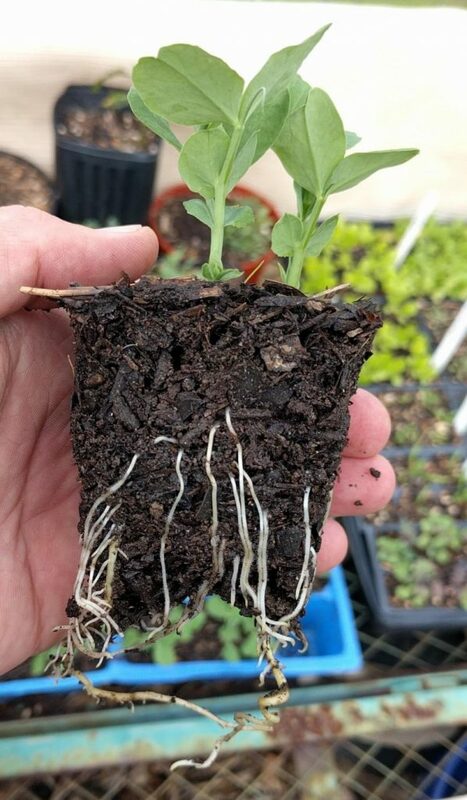 Roots on seedlings shown in photo above. My preference is for sowing peas instead of buying seedlings though. They’re just so easy to succeed at. Small children can even do it well since the seeds are so big and easy to handle. My boys ages three and five sowed these peas all on their own on December 18. 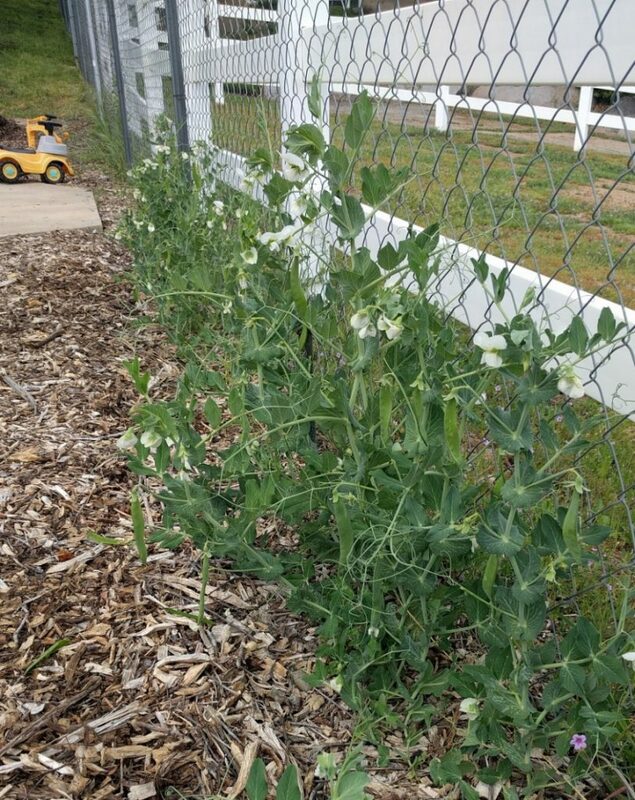 Updated photo: Just starting to harvest the kid-sown peas in early April. Shelling peas are the type I prefer these days, as I mentioned. I haven’t tried a variety that I didn’t like. Some of my favorites have been Green Arrow and Wando. I also use many of my own saved pea seeds. 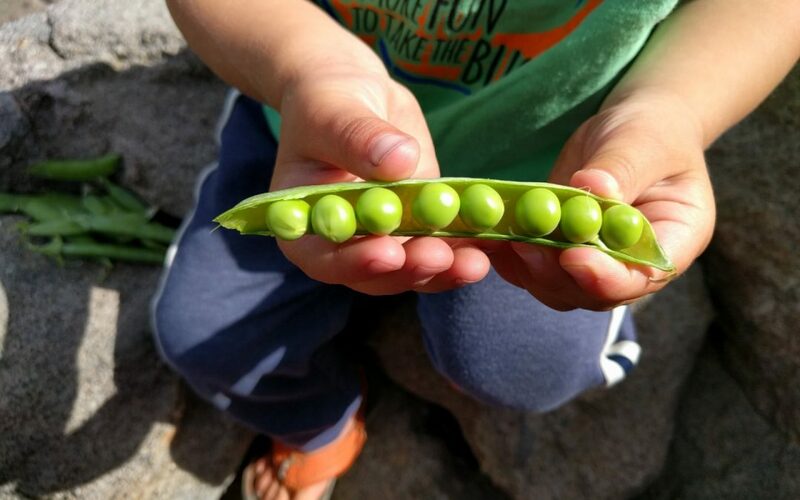 Toward the end of the harvest season in spring, I let some pods that are particularly big and full of peas continue developing on the plant until they start to yellow and dry. At that point, I pick them and let them fully dry in my garage. They keep well for months, until it’s time to sow peas again in October. The plants I’ve grown from my own saved seed have always produced well. Oddly, I did get one plant this year that has abnormally colorful flowers. If it tastes good, then I’ll save a couple of its pods for seed and see if the color comes through in its progeny. If you want to eat the whole pod, then you’ll grow edible-pod types, also called snap or sugar snap or snow peas. Their pods are more tender and don’t have a fibrous string like the shelling types have. You’ll be disappointed if you want to eat the whole pod but don’t grow edible-pod varieties. There are lots of good edible-pod varieties, many with “Oregon” or “Sugar” or “Snap” in their names. Some varieties of peas grow taller than others. 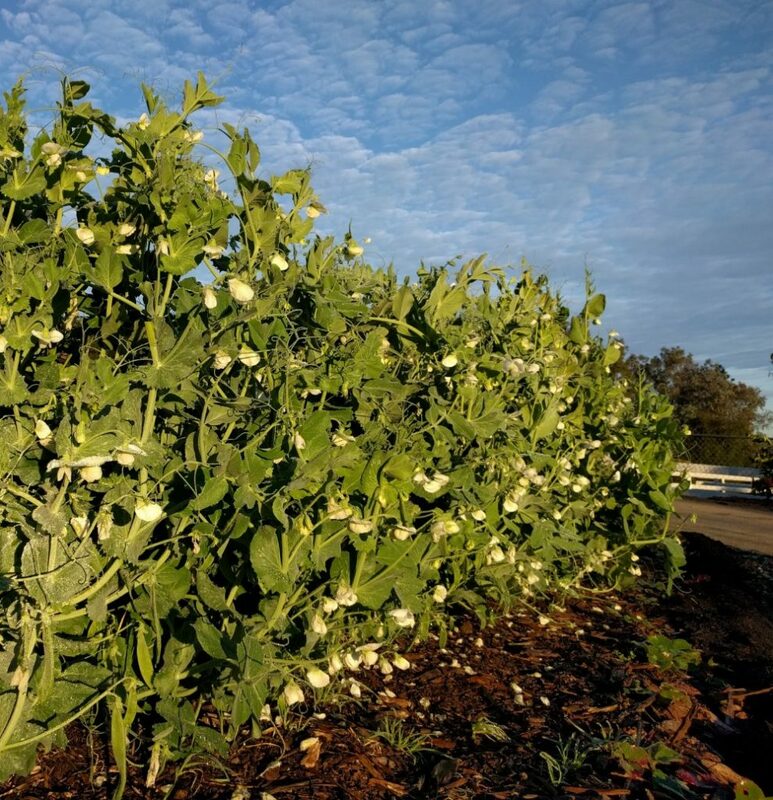 The shorter varieties of peas are often called bush or dwarf and they can be grown without anything to climb up, but it’s best to plant two rows so the plants can lean on and grab each other. They climb on their neighbors to a degree. 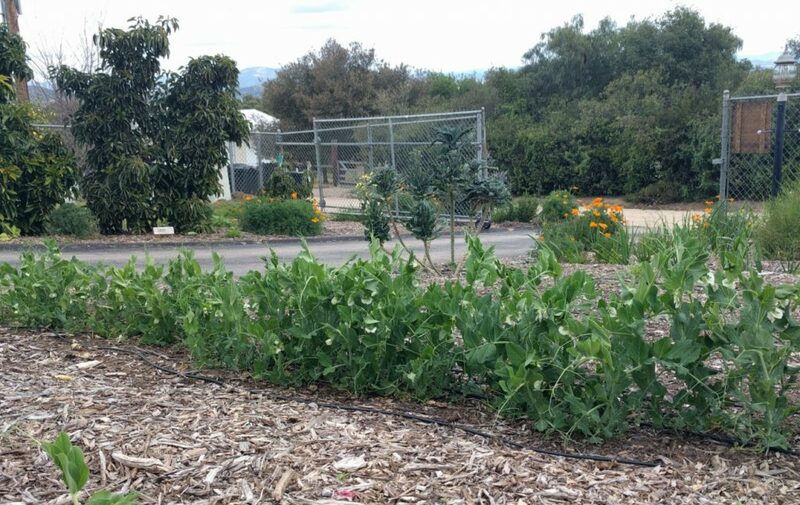 Double row of pea plants (six inches between rows) growing without vertical support. 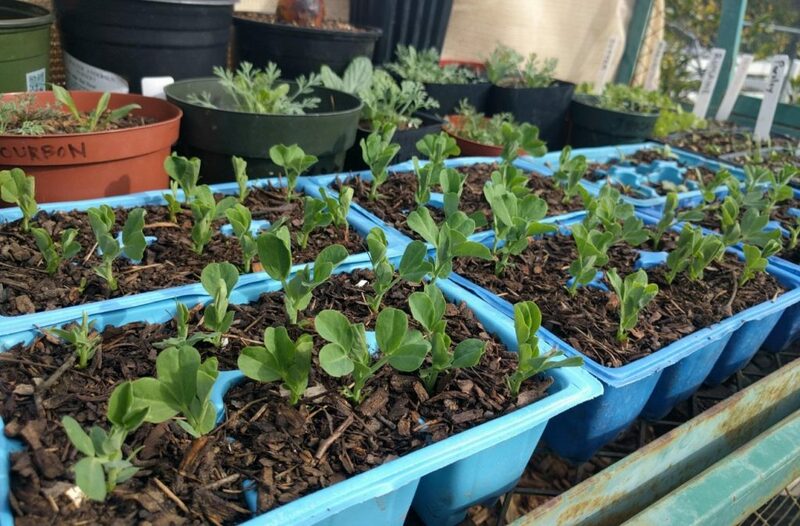 The more you can get any pea plant to grow up off the ground rather than crawl on the ground, the easier it will be to harvest. And the taller ones, usually called climbing or pole types, definitely grow best if given something to climb. They will wrap their tendrils around things and climb surprisingly high. Lots of structures can work: chain link fences, netting, poles, tomato cages. 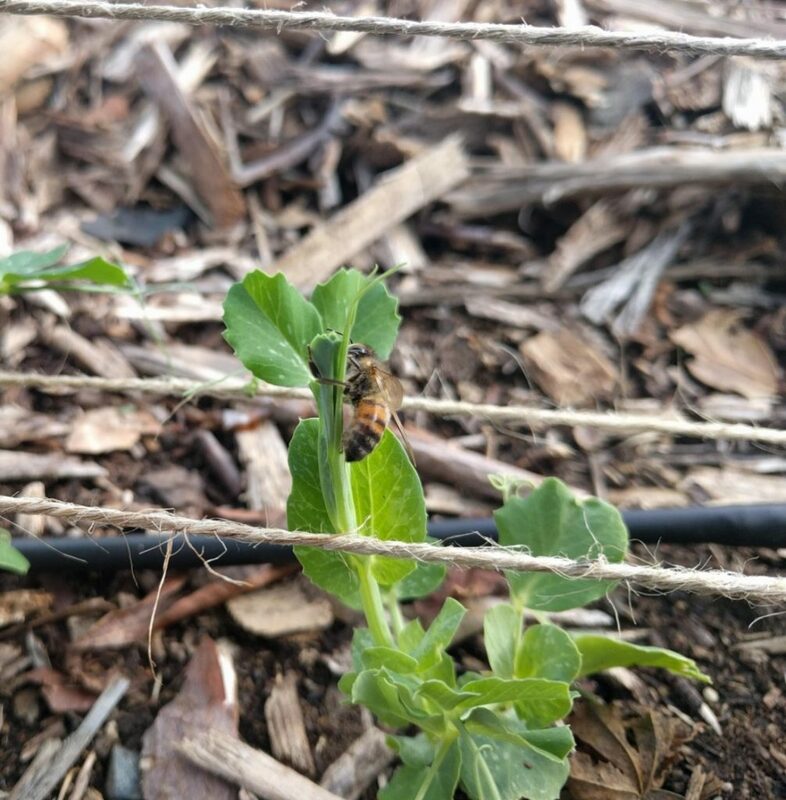 The way I most often provide something for my peas to climb on is by placing stakes at the ends of the rows (and in the middle if rows are long) and running twine between the stakes. It works although it is a chore. Poor pea is trying to climb and this bee is weighing it down. You can wait until the plants are five or six inches tall, then run twine on either side of them to gather the plants together and get them standing more erect. Then run horizontal lines of twine every five inches or so up the stakes. Pea plants climb such a set up pretty well for me. In winter, picking peas is leisurely. They grow slowly in winter. In spring, they seem to go from too slim to too fat every time you turn your back. In spring, you need to harvest almost every day. 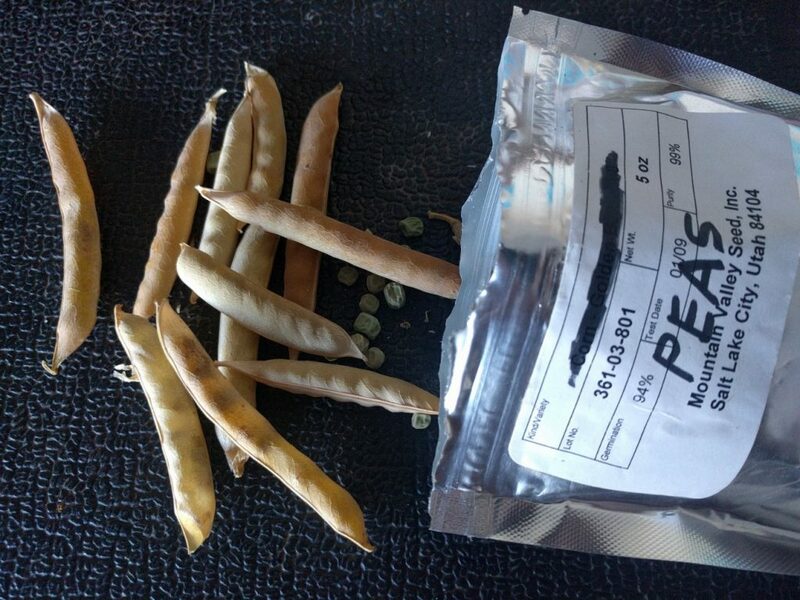 For edible-pod types, harvest before the peas bulge much inside the pod. For shelling peas, they’re best harvested when the pods are fat but before they lose their green shine. Wait just a bit too long and the peas will be tough and starchy. Harvest too early and the peas will be small but at least they’ll be tender and sweet. For best results, graze daily by gathering a handful to eat with your brother on the shady porch. Or, if you’re older and stronger, haul loads up the nearest rock. The only disease or pest that I’ve experienced on peas is powdery mildew. But it’s nothing to worry about. Powdery mildew appears on pea plants every year as it warms in spring. I do nothing to fight it. Keep harvesting until the powdery mildew gets too bad and the pea plants decline. Then enjoy the change of seasons. Sorry boys, everything has a season. Let’s plant some tomatoes or corn or melons here. Go grab an apricot or a nectarine to snack on. 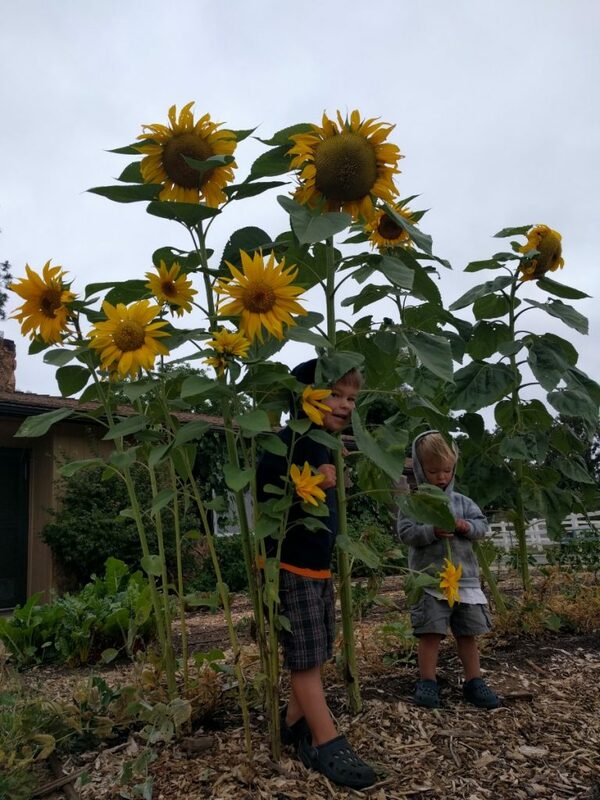 Yes, yes, it was cool that you got the peas to climb up the sunflowers. But now it’s the sunflowers’ turn. I love your posts I always want to run out there and play in the dirt!! I can’t wait to plant some peas again! Thanks for the inspiration! I love peas and have good annual success. 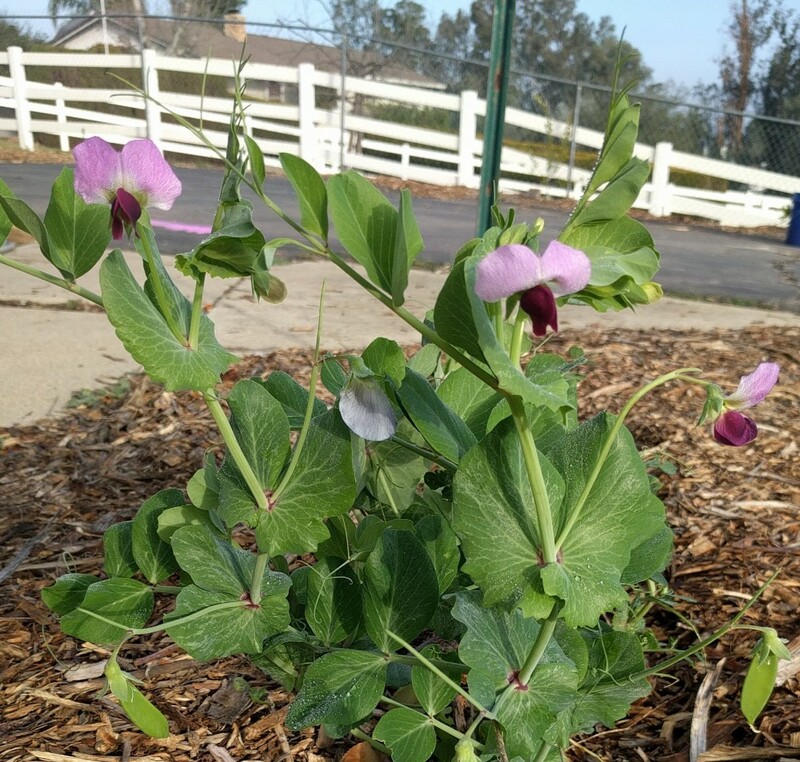 This year, for some reason, both edible pods peas and sweet peas have had the edges of leaves nibbled on, then consumed and eaten to the ground. After loosing several rounds of crops, I am having success growing them inside of mesh, which I am now removing once they are large enough. I can’t figure out what would eat both kinds of peas. So glad you mentioned this. I too have seen some nibbling on some of my young plants this year. I’d forgotten about it. It’s weird because it has only happened to some plantings. I have four plantings of peas at the moment, and two are untouched while two have nibbling. I’ve never seen anyone doing damage during the day, and at night I’ve only ever found a single pill bug munching on one seedling. I’m perplexed. I’m starting to suspect birds. Maybe I’ll try some mesh too. Thanks. I have tried mesh and it works. The question is when to take it down. I took it down once the sweet peas took off and they have been fine; but when I took it down from the sugar snaps, they got nibbled again. I wonder about rats. Thanks for the update. I planted a new pea crop today (seedlings). I’m going to keep a close eye on them, both day and night, and I’ll try mesh to see if it helps. Greg, do you use an innoculant? I don’t. Have you ever? I’m curious to learn more about it. I can’t seem to find a study about inoculating pea seeds versus not. I’d be most interested in a study done in a garden setting compared to a farm, but finding such a study is highly unlikely. Another good post. I decided to buy an avocado tree today after reading all your posts about avocado. I got it from Clausen Nursery in a 15 gallon container. The tree is about 6 feet tall with a lot of flower. When I transplant it to the ground, should I remove all the flowers so that the tree can concentrate on growing new leaves instead of bearing fruit in the first year? Thanks :). Congratulations on your new avocado tree. Don’t worry about the flowering. Leave them be. It’s unlikely that the tree will hold more than a fruit or two to maturity at this point, and that won’t make any practical difference in how well the tree settles in and grows this year. If it is magically still holding ten fruit in August, then I’d consider thinning some then. Great post. Your colorful pea plant looks to be a sugar magnolia, BTW. The purple veining is the giveaway. 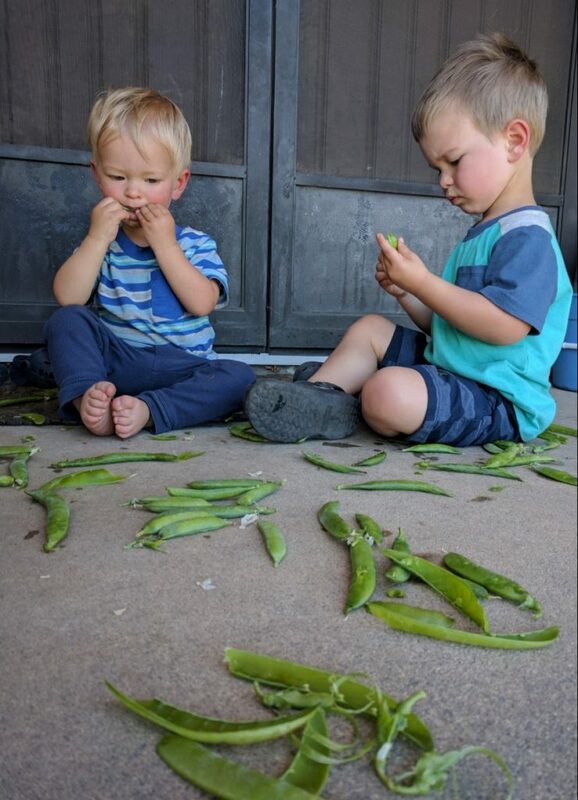 I prefer sugar snap peas but may try growing shelling peas as my 15 month old twin boys prefer just the pea, not the pod. One question is how far apart do you space your pea plants from each other? Do you find that makes a difference? I’d never heard of Sugar Magnolia, but I looked it up and it appears that the pods on that variety are also purple whereas the pods on my pea plant are green. It’s only the flowers that are pink and purple. 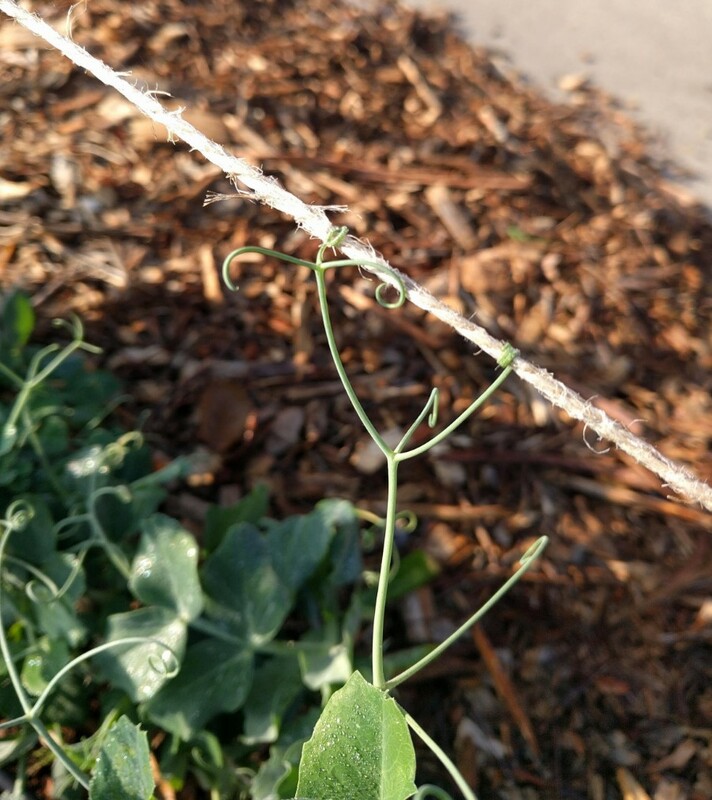 I usually space peas just a couple inches apart. I find that they’re very productive even at such close spacing although harvesting is a bit of a treasure hunt in the jungle. My kids have fun with that though.